The Surf Shack II (built in 2015) is a 2nd story studio condo located 50 yards (literally a stones throw) from the Atlantic Ocean. Enjoy our Pristine, Secluded beach, and our Crystal Clear Pool (open seasonally). The Surf Shack II boasts a Modern Design Concept complete with Gorgeous Luxury Plank Flooring, Beadboard Paneling, and Crown Molding. Let your cares melt away and enjoy a beverage of your choice, as you Enjoy our Stunning Atlantic Ocean Sunsets from either one of our 2 Oceanfront Gazebo's or from our shared 2nd Story Balcony Seating. Take advantage of our full kitchenette, or BBQ on one of our outdoor charcoal grills and enjoy open air dining on our picnic tables. Restaurants and Molly's Beach Bar, are a short walk away for the foodies out there :) (See overhead Satellite Photo for the location of your condo in this Oceanside Condo Complex). Perfect getaway for a romantic weekend, or a family retreat ... watch dolphins splash from the oceanside gazebo ... don’t miss the sunset disappear beneath the ocean waves .... stroll the sandy beach ... build a sandcastle with the kids ... surf cast or fish from nearby pier ... watch surfers hang ten.... or just relax by the pool... We even have a separate fenced in kiddie pool for the little ones. 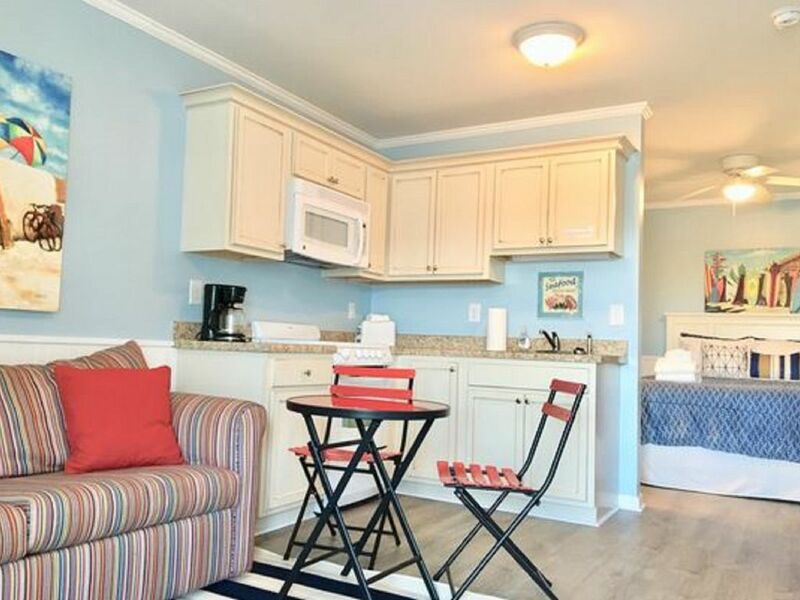 Linens and Towels are Included: Entire Unit is professionally cleaned prior to your stay. The unit is equipped with 2 sets of sheets, 4 bath towels/wash cloths, 1 bathmat, and 1 kitchen towel. There is a coin operated laundry room within the complex. - Max occupancy 4. Ideal for 2 adults or 2 adults with 2 small children. - Ocean Sands is a SMOKE FREE COMMUNITY (STRICTLY ENFORCED). New Stand Up Shower with a Comfortable Sitting Area. Gorgeous New Flooring! The entire building is next to the Ocean. Note: This unit faces inward of the complex. (See Overhead Pics for Location). Ocean Views can be found in multiple areas from the building. 4 sets of everything is provided. Huge 3 acre grassy area to relax and unwind, or for the little one's to play in. We have a Wraparound Balcony on the 2nd Floor. This is a Community use area and offers seating for Amazing Views on the Ocean Side of the building. Rent a Kayak in Beaufort and Kayak to Carrot Island to see the Wild Ponies! Wraparound Style deck with Public Seating on the Ocean Side of building located just around the corner from your unit. May be able to rent Court time at Island Beach and Racquet Club, which is just next door. Also there are free Tennis Courts in Morehead City. Country Club of Crystal Coast is only 1.5 miles away. We enjoyed our stay in the condo! It is small, but perfect for a couple and very well maintained. Loved the décor and fully equipped kitchen! It is close to grocery stores, restaurants, and lots of outdoor activities. We biked the trails, walked on the beach and took the boat over to Shackleford Banks. Thanks for sharing your condo! Edward was so amazing and accommodating!! It was my first time using Homeaway and he was so very helpful! The condo was so cozy and sweet, not to mention spotless! Perfect location and very quite! Edward was very easy to contact if needed! Best experience! Thank you for a quiet and wonderful stay on the beach! I got married during our stay and it was an amazing stay for a honeymoon I would recommend a small coffee table because our room did not have one at all. Cozy place perfect for two. The bed was comfortable, and the owner was very attentive. Super close to beach. Lots of things to do near by. Attractions each year: Atlantic Beach Music Festival, July 4th fireworks, MCAS Cherry Point Airshow, Beaufort Music Festival, Big Rock Blue Marlin Tournament, NC Seafood Festival, Summer by the Sea, Pine Knoll Shores Aquarium, Salter Path Clam and Scallop Fest, Flounder Surf Fishing Tournament, Buddy Pelletier Longboard Contest , Beaufort Blackbeard Pirate Festival, Ducks Unlimited 'Band The Billfish', Pirate Week at the N.C. Maritime Museum , Carolina Chocolate Festival, Crystal Coast Civic Center functions, Emerald Isle St. Patrick's Day Festival, Carolina Kite Fest, 11th Annual Antique-A-Thon , Fort Macon Civil War Reenactment, Annual Wooden Boat Show. Or just lounge at the beach/pool, fish, surf, play horseshoes, or enjoy the breathtaking sunrises / sunsets. Tennis courts & Golf courses are nearby. Atlantic Beach Bike Path and New Park are ready for you. Bike rentals w/ free delivery are available.